Chameleons are known for their ability to change colors. Some species such as the Namaqua chameleon become black in the cold morning air so as to absorb heat and then turn to a lighter shade of grey during the day to reflect light, preserving energy. Smith's dwarf chameleons adopt camouflage colors whenever a predator is threatening since an unseen lizard is less likely to be eaten. 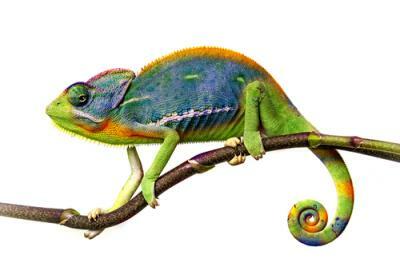 Like chameleons, payday loan companies are adaptable. They change colors whenever a different look benefits their business or makes them harder for regulators to find. They have been compared to reptiles and not only because of their camouflage capabilities. The purveyors of short term emergency loans have been attacked by consumer advocates and regulators in numerous states who are appalled at the fate of customers that end up paying even more in fees than the original principal borrowed. Regulators try to limit the abuse, but payday loans then mutate into car title loans or installment loans. The abuse can go on as long as the unseen reptile hides. For its part, the CFPB is working to standardize rules and enforcement, and to close the loopholes in state laws as it chases these critters. Here is how a typical payday loan works: a customer borrows a small amount, usually less than $500 to be repaid within 2 weeks. The customer often can't afford the terms and the balance is renewed each time with added penalties. A CFPB study shows that 4 out of 5 loans are rolled over within 14 days, racking up fees at every step in the process. According to the Pew Charitable Trust, the $46B payday loan industry charges annual interest rates ranging from 200% to 500%. Fees and penalties are additional. Now the CFPB is not allowed to cap interest rates - that is the domain of states - but they can act against unfair, deceptive or abusive practices. They have recently stepped up this enforcement. In one case, a large Texas payday loan outfit was accused of using illegal debt collection tactics including borrowers being bullied into taking out more loans and threatened with criminal prosecution. They have had to refund $5mm and pay a $5mm penalty. There is more to come. New federal rules aim to require lenders to check a customer's ability to repay a loan by assessing the customer's income, other debts and payment history. Payday loan companies will have to know their customers more like a bank. Consumer advocates are lobbying for minimum terms longer than the typical 2 weeks and would like to limit the number of loans allowed as well. A CFPB study tracked payday borrowers during a 12-month period. An average customer asked for 10 loans and paid a median fee of $458 on a $350 loan. A Colorado experiment demonstrates how new rules could help. The state limits annual interest payments to a maximum of 45% and requires lenders to give at least a 6-month respite to repay the loan. Results are promising, average APR fell from 319% in 2009 before the changes to 129% in 2012. The average number of loans per borrower dropped from 7.8 to 2.3 and they saved $42mm. Consumer advocates would like to enlarge the pool of lenders. Some banks are offering deposit advance loans with smaller alternative fees of $7.5 per $100 loan, but mostly small short-term loans to high risk borrowers are a no-win market for banks. There is most certainly need for a better provider, but regardless of how many times payday loan companies change colors, it is clear that they remain predatory reptiles, waiting to devour those who use their services. Treasury yields fell 2bps by the close as investor concerns with the general state of the economy fueled appetite for the safe-haven asset. Yields are unchanged from the prior session as the market is getting ready for retail sales and PPI numbers to be released later this morning. The New York Department of Financial Services has released a report warning banks to pay close attention to third-party vendors they work with, as some vendors may have potentially significant cyber security vulnerabilities that hackers could find a way to exploit. The FAQ from the regulators notes: 1) An existing high volatility commercial real estate (HVCRE) loan where funds are already advanced and a borrower contributes additional capital to meet the 15% contributed capital requirement would remain HVCRE because contributions must happen prior to the loan advance; 2) Acquisition, development or construction (ADC) loans made prior to the effective date Basel III would not be exempted from the HVCRE definition; 3) A borrower that owns real estate (and has no mortgages or liens on that real estate and that is unrelated to a project) cannot pledge the real estate to a project as collateral to count the value toward the 15% requirement and avoid the HVCRE classification (to qualify it must be contributed by the borrower in the form of cash or unencumbered readily marketable assets); 4) The "as stabilized" value cannot be used for purposes of determining whether a loan is an HVCRE exposure; 5) Banks may only use the "as completed" value of a project for purposes of determining whether it is an HVCRE exposure (three market value scenarios generally used by an appraiser are current "as-is" market value, the prospective market value "as completed" and the prospective market value "as stabilized"); 6) Cash used to buy land where the land is subsequently contributed to a new development can be used to count as contributed capital; 7) The 15% contributed capital requirement must be met before the bank advances funds. The latest Wall Street Journal of survey blue chip economists projects that GDP will be 2.7% in 2015, after seeing economic weakness in Q1.